Humberto Calzada was born in Havana, Cuba in 1944. He has been a Miami resident since 1960 and attended the University of Miami where he earned degrees in Industrial Engineering (1966) with an MBA in Finance (1968). He practiced engineering for several years but, by 1976 he had completely abandoned the career for a career in art. The theme of his paintings, from the beginning to the present time, has always been the colonial architecture of his native Cuba and of the Caribbean. Born in Havana, Cuba, Calzada’s work is strongly influenced by his native city’s colonial and neo-classical architecture. He is renowned for placing its architectural imagery in surreal, dreamlike settings to explore themes of loss, decay, and rebirth. Beloved by collectors and museums alike, Calzada’s prolific output of paintings numbers in the thousands. In 2006, the Lowe Museum of Miami honored his career with a 30-year retrospective entitled “In Dreams Awake.” Previously, the Bass Museum of Miami Beach exhibited his 15-Year Retrospective. For a full listing of the numerous museums, galleries, and corporate collections that have housed his work, see his curriculum vitae. Calzada resides in Miami, Florida with his wife. He has an engineering degree and an MBA, which he put to use briefly before dedicating himself to painting full time. His daughter is a designer and his son is a filmmaker. He has three grandchildren. In 1977, he began exhibiting his work in Forma Gallery in Coral Gables and continued exhibiting in galleries like Galeria Arte Actual (Santiago de Chile); Galeria 9, (Lima, Peru); and Galeria Acquavella (Caracas, Venezuela). He has participated in important group shows like “Hispanic Artists of the Southeastern United States” (Lowe Museum in Coral Gables, Art Museum of the Americas in Washington, DC); “Cuba-USA—The First Generation” (Museum of Contemporary Art, Chicago and Fondo del Sol, Washington, DC). His work is in the permanent collections of the Smithsonian Institution, Lowe Museum of Art, the Bass Museum of Art, The Museum at FIU, the Museum of Art in Fort Lauderdale, the Museo de Arte de Ponce (Puerto Rico), Museo de Bellas Artes de Santiago (Chile), and the Norton Gallery (West Palm Beach, Florida). His work is also well represented in many private, public and corporate collections. 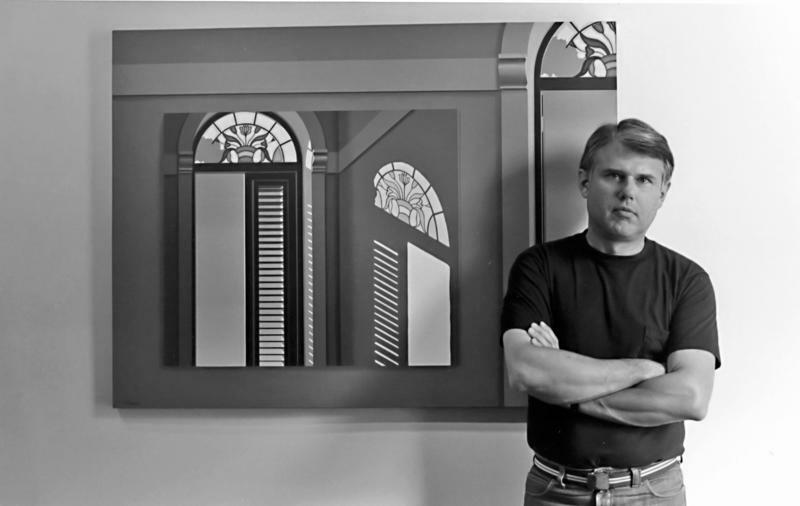 In 1991, he had a retrospective show of his first fifteen years of work at the Bass Museum of Art in Miami Beach, in 2006 he had a thirty-year retrospective at the Lowe Art Museum at the University of Miami, and in 2011 he had a one-man show at the Frost Art Museum at Florida International University. The Anecdotal Period paintings. Paintings of a more personal nature painted in a detailed but casual style, based on memories of his home, places he knew and visited in Cuba, and other specific recollections. This is his most recurring theme and the one that he is most identified with. The Surreal Theatrical Scenarios paintings. Extracting elements of Cuban architecture and placing them out of context in an unlikely setting. Meta-Art paintings. An extension of the theatrical scenarios but incorporating his past works in the walls as one more element. The Gardens paintings. Ruins, incomplete buildings, but still recognizable as Cuban architecture of the neo-classical period. Still Life paintings. Brief period in which architectural elements were arranged as classical still life painting. “Years of” Paintings. These are the flooded spaces, which consist mostly of houses in which the ocean waters have entered. It is one of his favorite iconographies because water has a dual meaning: it can mean total destruction, but it can also mean re-birth. Homenages to other painters. Paintings which can either be Calzada in subject but another painter in technique or style or a Calzada painting in which the work of another painter is either hung or displayed in the space portrayed. The Night paintings. Paintings of architectural and/or landscape themes at night. La Hora Azul paintings. Paintings of architectural and/or landscape themes during the dusk hours. The swimming pool paintings or Cuba circa 2025 painting. An optimistic assumption that in the not-too-distant futures, Cuba will not only have houses in good repair, but also houses with swimming pools. The Reconstructing Havana paintings. A much-enlarged photograph of current private and public buildings in Havana is partially “reconstructed” by painting in what once was and what, someday, could be again.